Lyme Disease continues to be very common in the Midcoast Maine area but we're seeing anaplasmosis and other tick-borne diseases more frequently. 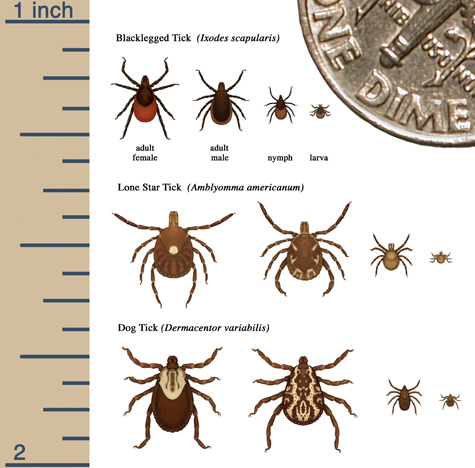 Knowing how to prevent tick bites and considering tick-borne diseases when symptoms occur continues to be important. The CDC has useful information on its web site and even an iPhone, iPad and Android app for this. Posted on August 2, 2015 by Brian Pierce and tagged Lyme Disease anaplasmosis babesiosis ehrlichiosis permethrin doxycycline Direct Primary Care. A local TV station reported recently on several Maine physicians who joined Florida's MDVIP franchise. A lot of people get concierge medicine practices such as MDVIP confused with Direct Primary Care. Both give patients great access to their own physician and unhurried appointments. Concierge practices tend to be more expensive and many charge insurance copays and deductibles on top of their membership fee. Direct Primary Care is simpler and less expensive because it removes the insurance middlemen, often saving money, especially for those on high deductible plans and the uninsured. Posted on July 26, 2015 by Brian Pierce. I've been moonlighting as a hospital physician at two Maine hospitals while we get Megunticook Family Medicine established. One of them is having a bit of a manpower shortage right now and I'll be busier than usual there for the next week. This will not be a recurring issue as I've already made some significant adjustments to my schedules after this month. I'm going to take the next week as a working vacation. What that means is I will be available by phone but we'll schedule any routine follow up, new patient and physical exam appointments after next Wednesday 5/12. We'll handle urgent issues on a case by case basis as always. Jen Overlock will be here and available to help as usual. I'm grateful to be able to work as a hospital physician while getting the practice off the ground and to help the hospitalists by filling in when needed. However, my priority continues to be Megunticook Family Medicine and my patients. Posted on May 7, 2015 by Brian Pierce. Direct Primary Care (DPC) is simple, but health insurance and its interactions are not. We accept insured and uninsured patients except that we (temporarily) cannot accept patients with Medicare, but plan to later this year. So far, all but one Maine insurance policy will cover tests and referrals we order. We do not bill insurances, but patients may submit for reimbursement. All patients get great access and lower costs than insurance based practices can offer. Red yeast rice is commonly used as a supplement to lower cholesterol as it has the same active ingredient, lovastatin, as Mevacor, a cholesterol lowering statin drug. No routine appointments today but I'll be available if you have questions or an acute problem. Posted on February 16, 2015 by Brian Pierce. I'll be available by phone (207-390-8570) and via the Elation EMR portal but, like most of Maine, our office will be closed Tuesday 1/27. Posted on January 26, 2015 by Brian Pierce and tagged snow day. Our exam room is getting new flooring so, while our office and phones are open, we won't be seeing routine appointments today. We'll be open tomorrow with a shiny new floor. Posted on January 14, 2015 by Brian Pierce. Megunticook Family Medicine "launched" just over a week ago. We opened appointments for a few patients who needed care before we could fully equip the office. This was a great opportunity to test our plans and we've made some adjustments from what we've learned. We also simplified our membership plans, choosing to use the lower membership fee plan for all patients this year instead of our initial intention to offer two levels of membership. Without a rushed office schedule, we got a glimpse of the benefits of Direct Primary Care. Jen and I had time to phone consulting specialists and coordinate care for a patient, saving that patient a long drive out of town. We also saved a patient with a high deductible insurance plan quite a bit on an expensive test by "shopping around". While stocking the office continues this week, we are happy with our progress! Patients who've expressed interest in joining the practice should expect to hear from us with registration information and materials. Posted on January 14, 2015 by Brian Pierce and tagged news USCG nostalgia. I'm thrilled to announce that Jennifer Overlock has joined Megunticook Family Medicine as practice manager, medical assistant and phlebotomist. Jen will be familiar to patients from my former practice as she supervised medical assistants and managed the laboratory there for years. Her knowledge of primary care, local medical resources and our patients will be valuable as we launch direct primary care in the midcoast. We've been busy this week organizing the new office, ordering supplies, and testing phones as well as using our new software to manage referrals and order medical/lab tests. Posted on January 11, 2015 by Brian Pierce and tagged staff news.